With long blade chisels out of the way, I thought I'd also take a look at small chisels (palm chisels, micro chisels, etc.) that are more commonly used for detail carving. Because of the length, they will not fit in a jig, and they really do not need one. That is to say, jigs in general are not necessary, but here they are highly impractical. First step, as always is preparing your stones, whatever sort they may be. 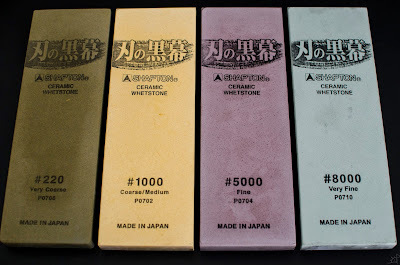 My water stones do not need to be soaked, so running them under the tap for a few seconds is sufficient. 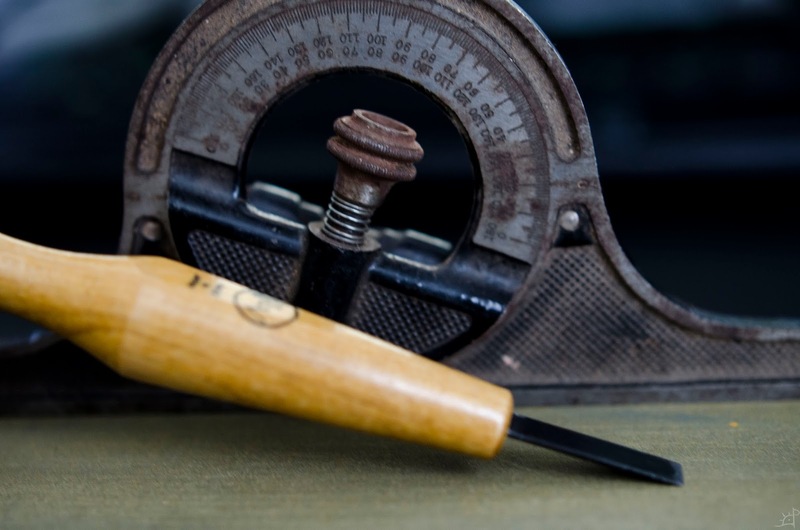 The chisels that I will be sharpening in the next three posts are significantly harder (65 Rc) than normal chisels, which is both an advantage and a drawback. While they hold an edge far longer, they also chip very easily. As a result, I need to make use of the very coarse stone to bring the edge back into a line. 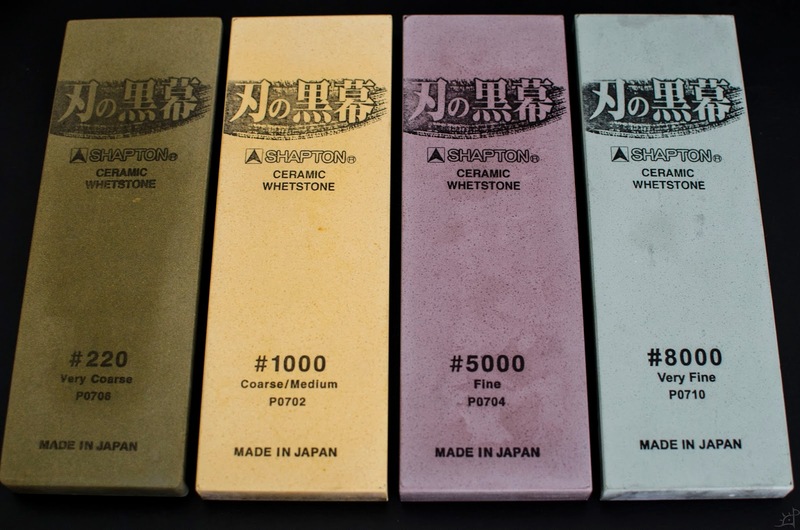 From there, it is the same grit progression as I would use on an already shaped edge. For these smaller chisels, I set a lower angle on the bevel, in this case around 20 degrees. I would prefer around 25, but from the manufacturer they came lower, and I have taken it up only to 20. This in part is a cause of the fragility and tendency to chip, so for such hardness I will be taking it up another 5 degrees over time. 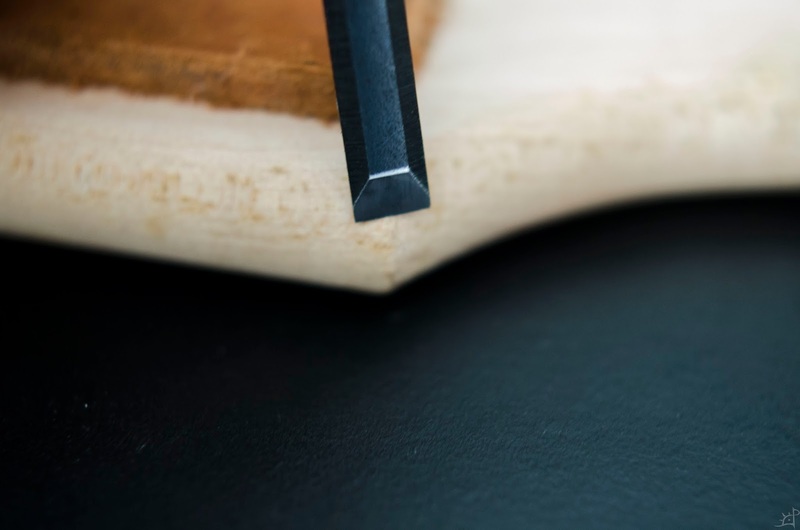 Once you have a feel for the angle on your chisel, try and keep your arms/hands as locked in place as possible to minimize any rolling of the flat edge. 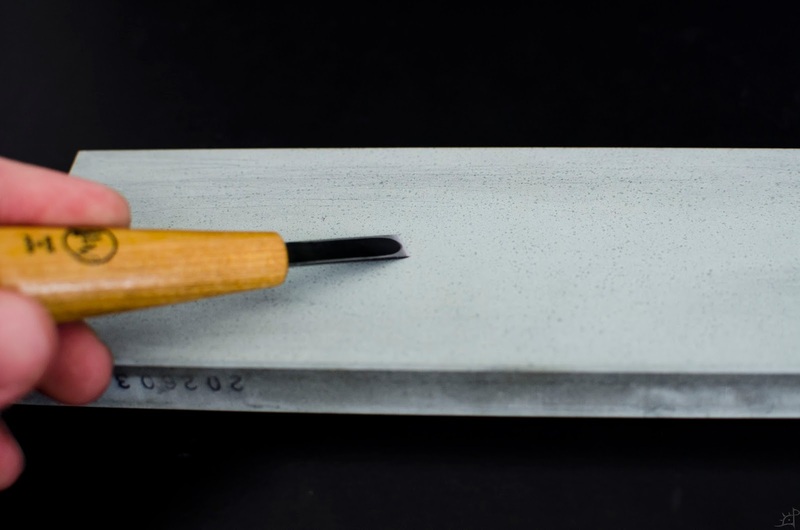 When I sharpen, I take the chisel to stone at a slight skew angle, applying downward force on the forward stroke (as though 'carving' the stone) and relieve force on the pull stroke. 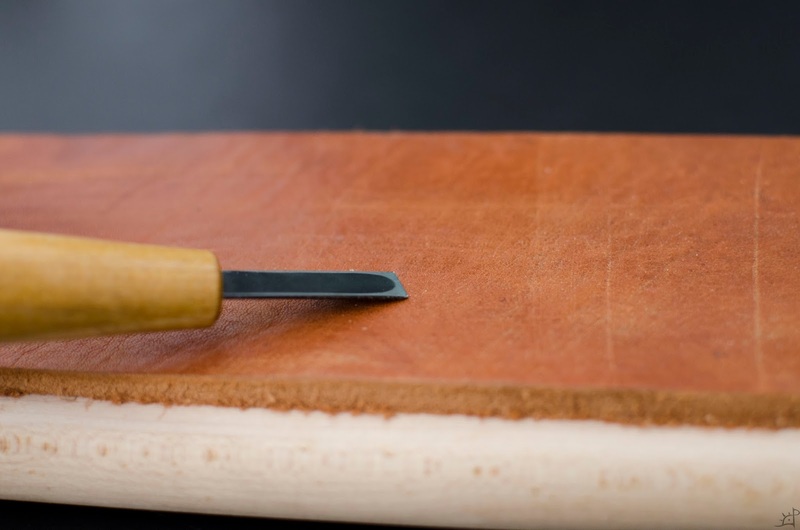 Assuming you have already surfaced the back when the chisels were new (shown in Chisels Part I), the only time you need to touch the back to the stone is when you begin to feel a burr rolling over thee edge. On the lower grit stones, I often do not do this at all, and on the highest only one or two quick passes to remove it. Holding the back flat against the stone, again at a slight skew angle. I prefer to push rather than pull, as this mitigates the chance of rolling the burr back to the other side, but it is just personal preference. After the final stone I turn to the leather strop. Treating it just as the final stone, I polish first polish the bevel, then the back with one quick pass flat against the surface. For a final stage, I take the edge and (left to right in the above picture) slide it across a corner on the piece of wood holding my strop. A very slight pressure is all it takes to remove that remaining minuscule burr. Although this is something that should be done throughout the process, I periodically check to ensure that the bevel is square to the blade of the chisel. For a straight chisel, that is. For a skew, this obviously doesn't matter. 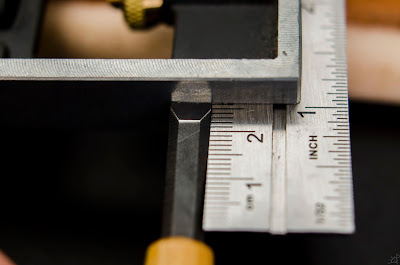 It should be noted that I treat skew chisels exactly the same way as straight, only that the edge is at an angle to the length of the chisel. 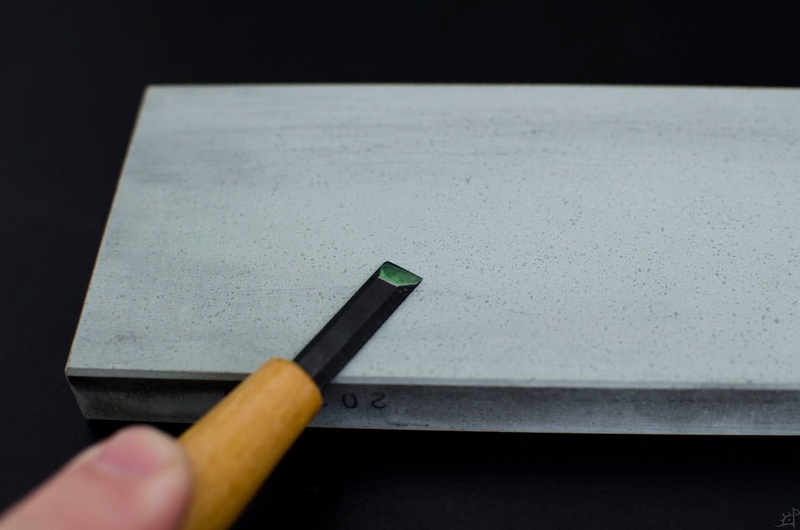 With these low temper chisels it takes a little longer, as the rough stones need more work to repair chips and the higher stones do not cut as quickly, so it takes between 5 and 10 minutes depending on the extent of the damage. If I am simply honing them back to a sharp edge, it will take a fraction of that.